The disciples were slumped in grief when Mary Magdalene burst in and told them the tomb of Jesus was empty. Peter and John set out running. John arrived first. They found the linen binding clothes, but the body of Jesus was gone. In this part of the story, the gospel writer John shortened the narrative, leaving out details the other gospel writers gave. For example, he did not mention the other women who came to the tomb with Mary Magdalene, but focused only on her. Nor did he mention the angels, messengers of God, who spoke to the women. For John, the important thing was that Jesus’ body was missing. Nothing else really mattered. Mary’s reaction to the empty tomb was spontaneous. She ran full pelt, back to the male disciples, to Peter and John in particular, and told them that Jesus’ body was missing, presumably stolen by someone. The other gospels contradict this by saying that Mary already knew from an angel that Jesus was risen. All one can assume is that there was a great deal of confusion about who said what to whom, which was hardly surprising in the circumstances. When Peter and John heard what Mary had to say, they wasted no time. 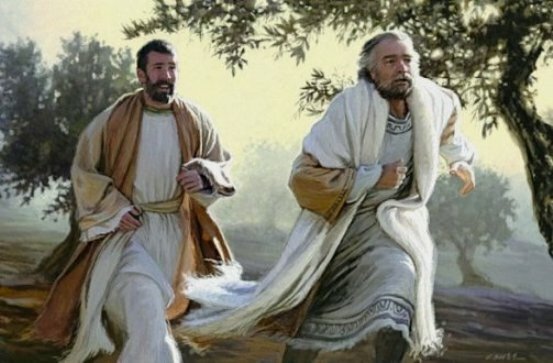 Peter ran as fast as he could towards the site of the tomb – but he was not as agile as the younger man, who soon outstripped him, arriving at the tomb some moments before Peter. It is a vivid, factual moment, meant to emphasise the reality of the scene. Shroud and head cloth lying discarded in the tomb of Jesus on the first Easter morningWhen John got there, he leaned down and peered into the tomb, but did not go in. He saw the linen clothes that had been used to bind the dead body of Jesus, but nothing else. 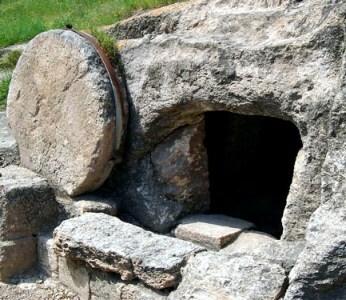 When Peter arrived, he did not hesitate, but went straight into the tomb, alone. There was no-one there. He saw the linen strips, and a little apart from them the square of cloth that had covered the head of Jesus’ corpse. 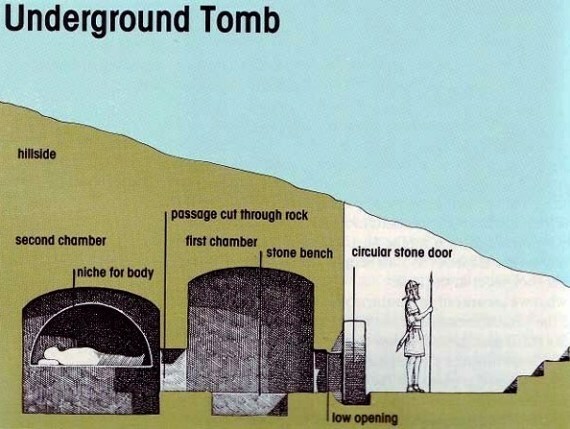 This is an important detail, a factual element that verifies Peter’s attention to what was in the tomb – and what was not. John joined him – a second witness to this scene. They looked around, but found nothing else – certainly no sign of Jesus. Then they went home, presumably to report back to the other disciples. They were beginning, slowly, to understand. Peter peers hard at the cloth. Again, another factual detail emphasises the reality of the moment. 3 Peter then came out with the other disciple, and they went toward the tomb. 4 They both ran, but the other disciple outran Peter and reached the tomb first; 5 and stooping to look in, he saw the linen cloths lying there, but he did not go in. 6 Then Simon Peter came, following him, and went into the tomb; he saw the linen cloths lying, 7 and the napkin, which had been on his head, not lying with the linen cloths but rolled up in a place by itself. 8 Then the other disciple, who reached the tomb first, also went in, and he saw and believed; 9 for as yet they did not know the scripture, that he must rise from the dead. 10 Then the disciples went back to their homes.